With age photos yellow, crack and deteriorate and before you realize it, your most treasured memories have faded. Or maybe that perfect picture turned out not to be as perfect as you thought. 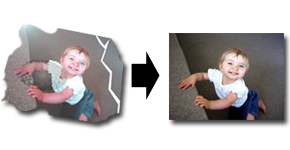 Our photo touch-up/restore will transform your photos into the perfect memories you deserve. Take out those unwanted parts of a photo or remove red-eye and lens spots. We can even take multiple photos and merge them into one! Charges for photo touch-ups are done by quote only. Send us your picture with a detailed explanation of what you need done and we will estimate the amount of work required. Old black and white photos lose quality over the years. As time goes by their content fades away. Stop the aging process and restore what has been lost. Send us your picture with a detailed explanation of what you need done. We will send you a quote with a quick copy of what the image will look like. Please note that some pictures are beyond restoration. Prior to doing any work we will let you know what can and cannot be done. Do you want something taken out of a picture? How about something added? We can manipulate any picture to add or remove whatever is needed. Send us your picture and let us know what you are looking for. If you aren't sure, just ask!